In Readings of Mr. G the composer Henrik Hellstenius presents the soloist not only as a musician, but speaker also; an actor in the widest sense. 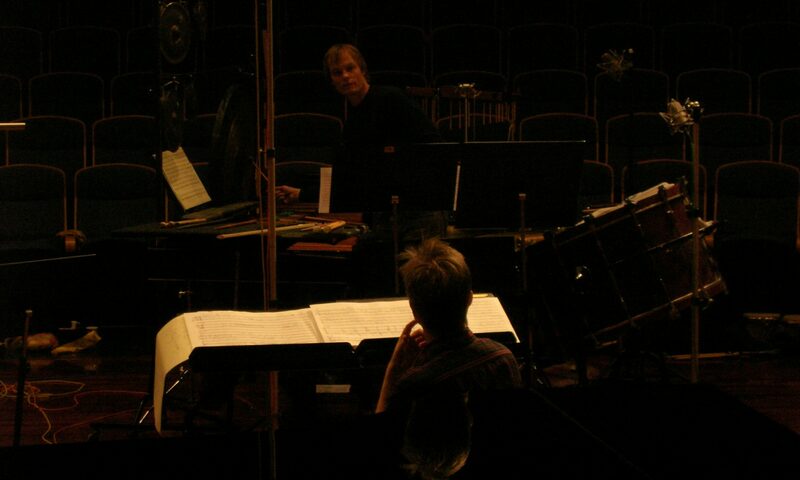 Instrumental and theatrical elements are combined in this concerto, that was tailor-made for the percussionist Hans-Kristian Kjos Sørensen. It was premiered with the Norwegian Chamber Orchestra conducted by HK Gruber. It has since been performed with Oslo Philharmonic Orchestra (cond. Christian Eggen), The Swedish Chamber Orchestra (cond. HK Gruber), Ensemble Allegria and Ensemble BIT20 (cond. Pierre-André Valade), which also did the recording. The visual artist Peter Knudsen has since produced a video that projects on the soloist on stage, reflecting upon the references and atmospheres that inspired the composer in the first place. The video was first presented at a concert with the Oslo Philharmonic Orchestra conducted by Christian Eggen in 2015. Hellstenius has also made a solo recital version of Readings of Mr.G. This version was premiered in 2010 and later released on the album Hearing Things on Ultron. The spoken texts are taken from the world of ideas of the mystic Georges Ivanovitch Gurdjieff as written down by his student Peter Ospensky. reading in the work does not just refer to reciting the text out loud; rather it is a form of artistic project, a rereading; i.e musical interpretation and reflection on the original text. The “Mr. G” of the title is thus a double character, present at various levels in the work. These “readings” are in accordance with what has been one of the principal traditions of composition for as long as the craft has existed. New works do not arise from a vacuum or as new “pure” ideas drawn from abstract creativity; they are created through active reaction to existing raw material, incorporated into the work in the form of text or sound, as in the familiar “cantus firmus” parts of medieval and renaissance compositions. (Such parts consist of already existing music, not just notes). At the same time there is something deeply personal about Hellstenius´ choice of Mr G´s – Hellstenius studied with Grisey from 1993-1996. Grisey was one of the central figures of the French school of “spectral music”; in addition to his love for refined timbres and textures that characterize the music, he was also very concerned with the mutual relationship between stringency and playfulness in the craft of composition in general, and with the various perceptions of time which can be created in the temporal art of music. These perspectives have always been important to Hellstenius. The link to Gurdjieff goes via the composer´s paternal grandmother Lilli Hellstenius, who spent large part of her life studying with Gurdjieff´s pupil John G. Bennett. Lilli Hellstenius emphasized the necessity of achieving a greater understanding of the world around oneself, and not least of finding the courage to live one´s own life. When the percussionist is forced to sing and speak, he is pushed beyond the limit of being able to rely on routine and self confidence. The courage this takes and the achievement reached express the vulnerability that is present when one exposes oneself to life´s challenges. This is crucial to the work; with a professional singer the experience would not been as apparent. Ant it expresses not least what Hellstenius call “the unmistakable tinge of comedy in us all.